As promised, Kunal and I are extremely excited to bring you a personal discussion with one of India's finest stock pickers. What does it take to be called a successful fund manager? One who beats the benchmark market indices by a few percentage points over three to five years. Now you might not think that's a difficult task. The competition is intense. Every year new funds are launched. Most fund managers chase the same stocks. It's very difficult to beat the index year after year. But Kenneth Andrade beat the market by three times over a decade. That period included the global financial crisis. So, who is Kenneth Andrade? From 2005-2015, Andrade managed IDFC Premier Equity mutual fund. The fund produced a stellar absolute return of 616% over a decade. The benchmark Midcap index returned 201% during the same period. This is an outstanding outperformance. This placed him comfortably in the top quartile of fund performance in the small and mid-cap segment. The short answer - smart stock picking coupled with prudent risk management. I am an avid reader of all that Kenneth has to say. I've been inspired by his clear, simple, yet powerful approach towards picking stocks since the past five years. Take his bet on Asian Paints way back in 2008. While the whole paints industry bled, Andrade was one of the first to identify the potential of Asian Paints. The stock has multiplied almost 10 times since then. This was not an isolated bet that worked for him. He successfully replicated his bets with others like Page Industries, MRF, Bata India, Va Tech Wabag, among others. His unique and differentiated thinking style gives him an edge. In his present avatar, Kenneth is the Founder and Chief Investment Officer of Old Bridge Capital Management. 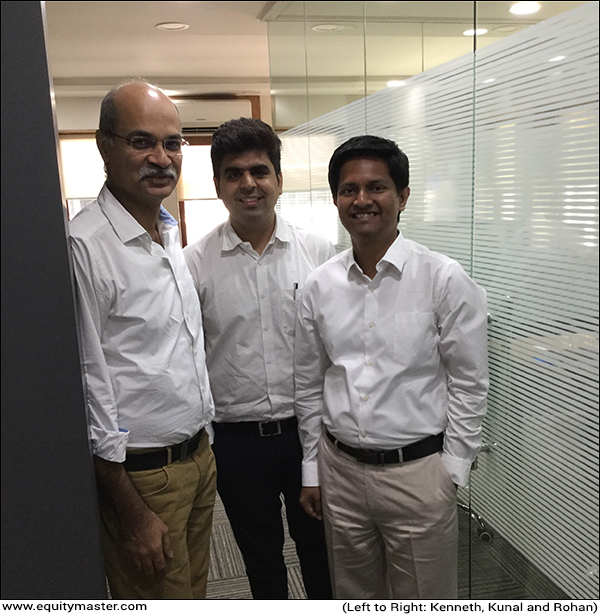 When we met him recently at his Mumbai office, we asked him his formula for selecting a stock. "Scale of opportunity, quality of the business, and price to be paid." Andrade has been active in the stock markets for over 25 years. He began investing at the age of 16. We asked him, what got him interested in stocks. "It was the process of...what was the science that drove stock prices." His first investment was in an IPO of a company called Digital Equipment India. The company no longer exists, as it was acquired by HP. The large gains made during the IPO boom of the late 80's and early 90's further boosted his passion for stock investing. A big transition for Andrade happened in the 1999-2000. He got an opportunity to head the portfolio advisory business working for Sharekhan. "The tech bubble taught me how to manage risk." On Circle of Competence: "I can do only one thing right. I can buy right or sell right. I have far fewer cases of selling right than buying right." He then moved to Kotak AMC in 2002 where he managed a small fund called Kotak MNC fund. A limited universe of stocks to choose from taught him a valuable lesson. "I learned to optimize given the constrained universe of stocks at my disposal and tried to come out better than most." His next stint saw him become the CIO of IDFC Asset Management. The learning was good and according to Andrade, he did better than what he set out to do at IDFC. "Buy when no one else is buying. In times of maximum pessimism is when you get right prices to buy. The risk-reward is most favorable. "I look for price to be paid for any company. I also look at status of the industry the company is in." We quizzed him further. What type of sectors does he like? Consolidation in the sector -> Resulting in fewer players. Low future capital needs -> It means there's enough capacity to fulfil future demand. And when you are looking to sell, the reverse holds true. Look for signs of fragmentation of industry (addition of new players), large build-up of capital needs, and slow improvement in profitability. How did he navigate the 2008 market crash? "We stayed out of businesses that had too much debt." The ability to minimize mistakes by knowing what not to do was of prime importance to him. Looking back at his varied experiences through life and having seen multiple market cycles has taught him the importance of staying curious and being a life-long learner. So, who are his role models? Andrade thoughtfully replied that he doesn't have any one role model in particular. There are many people who study other people's successes and make them their role model to emulate... Not Andrade. "You learn a lot from people who have succeeded but you learn even more from those who have not been able to." "I learnt from the mistakes that other people made. What not to do is also as important as what to do. In the last fifteen years, a lot of management have taught me what not to do." In November 2016, Andrade referred to notebandi like a speeding car having hit a wall. He felt it would take at least a year for the economy to stabilise. We asked him about his views on the current situation. "I misjudged that one completely. Indian economy is much more resilient than I had anticipated. Overall, it got over pretty fast." Towards the end of our interview, we asked him to answer a few rapid fire questions. MRF or Asian Paints Both. Movie or Annual Report Annual Report. I don't watch many movies. Growth or Valuation You look for a scalable business but it's always dependent on the price to be paid. Management or Strong Business Strong Business. Price/Earnings or DCF or Enterprise Value/sales Enterprise Value/Sales. Investing Horizon - 5 Years or 10 Years 5 years itself is too long! Stocks - Historical Performance or Future Expectations Historical Performance. Cash Flow Statement or Profit & Loss Statement Cash Flow Statement. Your Favourite Movie/TV Series I don't have a television that works at home! In today's interview, we've covered some ground with Kenneth Andrade. One of the most successful bets of Kenneth has been Asian Paints Ltd. In 2008, he looked at three key characteristics playing out in the paints industry. Low future capital needs -> Had enough capacity to fulfil the demand and healthy cash flows for future investments. Improving industry profitability - The shift from unorganised to organised. In 2008, profits of Asian Paints were flat though the topline growth was 20 percent. During the same time, other companies saw sales as well as profits fall. Asian Paints gained market share by holding its pricing. Today, Asian Paints has twice the profitability of the entire sector and thrice the distribution strength. Now, Asian Paints in last ten years has given a CAGR return of 30%. The company delivered on both sales and profitability front. Simply put over last ten years' revenues grew by 18% CAGR whereas profits over the same period grew by 23%. After opening the day on a positive note, share markets in India have continued their upward momentum. all sectoral indices are trading on a positive note. Stocks in the banking sector and stocks in the infra sector are leading the gains. At the time of writing, the BSE Sensex is trading up by 94 points (up 0.3%), and the NSE Nifty is trading up by 27 points (up 0.3%). Meanwhile, the BSE Mid Cap index is trading up by 0.3%, while the BSE Small Cap index is trading up by 0.5%. J Kumar Infra: Back from the Dead? JKIL has recovered smartly from its lifetime lows. Equitymaster requests your view! Post a comment on "Our Meeting with India's Peter Lynch...". Click here! 1 Responses to "Our Meeting with India's Peter Lynch..."
Where can we find enterprise value/sales ratio of indian companies, that you have mentioned in rapid fire questions.